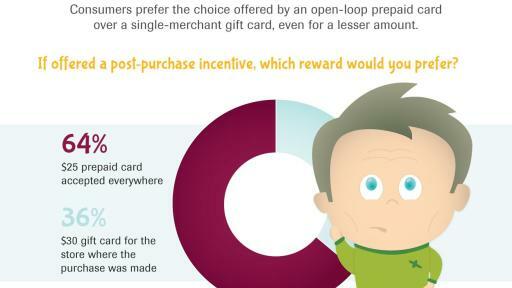 American shoppers prefer open loop cards—otherwise known as network branded cards—for post-purchase awards, even over other options with higher value, according to new research* from Blackhawk Engagement Solutions. The “People Prefer Prepaid” report from Blackhawk Engagement Solutions explored shoppers’ preferences for post-purchase incentives and overall adoption of prepaid products in their lives. 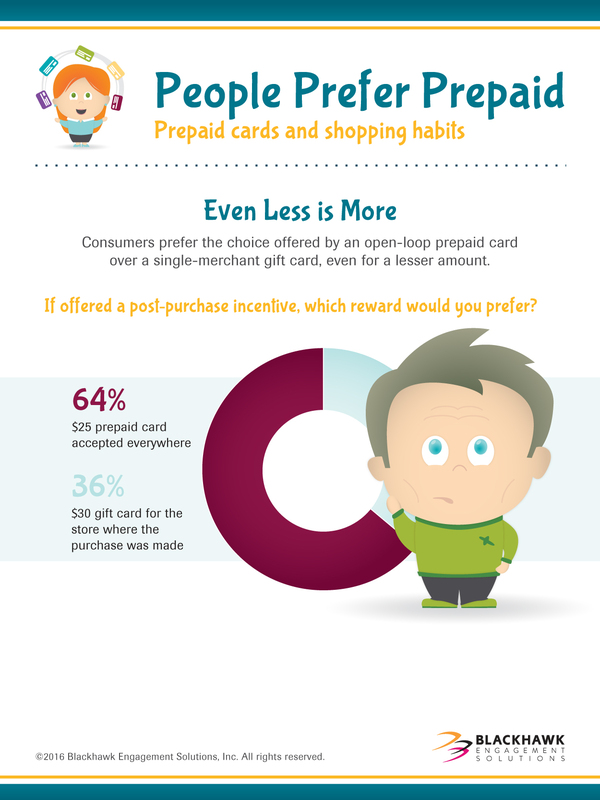 Open and closed loop prepaid cards are preferred rewards: When receiving a post-purchase incentive, 64 percent of consumers surveyed would pick a $25 open loop card that could be used everywhere and 36 percent would select a $30 gift card for the store where the purchase was made. 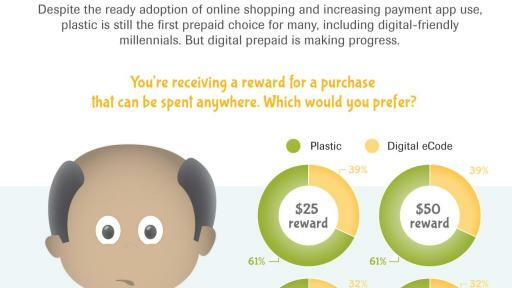 Both plastic rewards and digital rewards are in demand: Sixty-one percent of shoppers surveyed would pick a plastic prepaid card for a $25 post-purchase reward and 39 percent would choose a digital ecode. 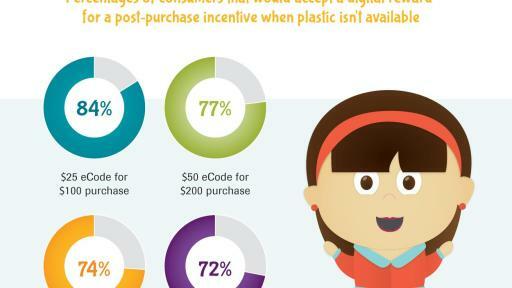 Growth in ecode adoption for incentives has been growing at a faster rate than plastic. 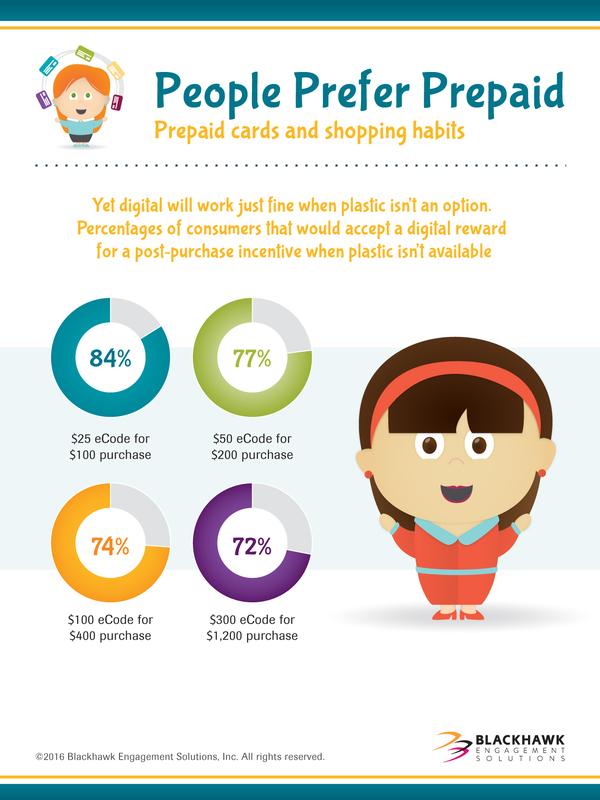 However, preferences shift more toward plastic when the reward is higher in denomination; when considering a $100 reward, 68 percent of those surveyed would pick plastic and 32 percent would pick digital. Comfort with digital rewards is significant: Eighty-four percent of consumers surveyed would accept a $25 ecode reward if a plastic reward was not available. Consumers are slightly less likely to accept an ecode the higher the reward amount; 74 percent would accept a $100 ecode reward on a $400 purchase. 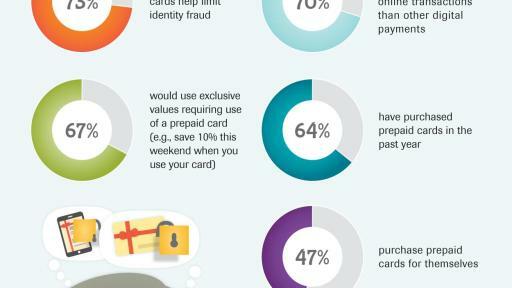 General acceptance and trust of prepaid products is high: When speaking generally about prepaid products (not just incentives), consumers we surveyed have a very positive perception: 73 percent believe prepaid cards help limit identity fraud, 70 percent believe prepaid cards are safer for online transactions, 67 percent would use exclusive values that require the use of a prepaid card and 64 percent have purchased a prepaid card in the last year. 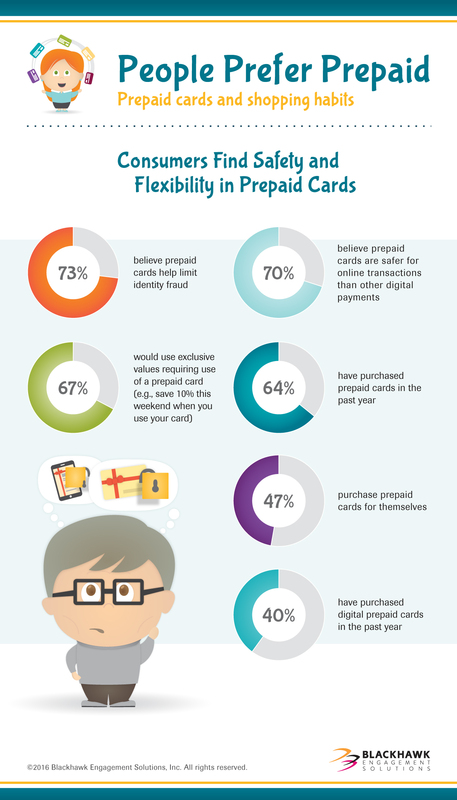 Additionally, prepaid cards are being regularly purchased for self-use: 47 percent of respondents purchase plastic prepaid cards for themselves and 40 percent have purchased egifts for themselves. 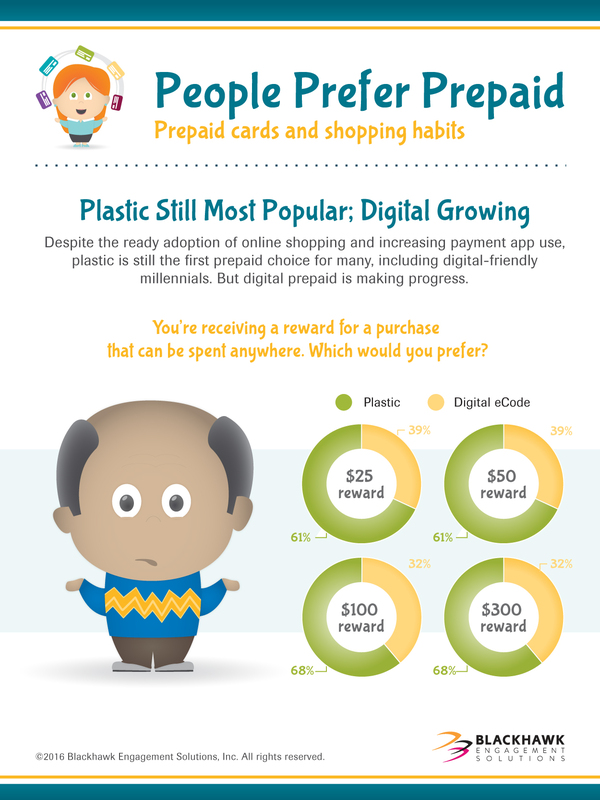 Check out the People Prefer Prepaid infographic here. Statistics for this report were derived from the Where It’s At 2016 Study, an Internet-based survey conducted by Blackhawk Engagement Solutions from March 3, 2016 to March 14, 2016. The sample size of 1,688 American respondents, ages 18+ at the 95 percent confidence level would equate to + or – 3 percent margin of error had this been a random sample. Blackhawk Engagement Solutions is a leading global provider of customized incentive and engagement solutions for consumer promotions, employee rewards and recognition, and indirect sales channels. We are a strategic partner with many of the world's leading brands and a thought leader that provides game-changing engagement solutions. Through our products, services and innovative technology, we inspire actions that impact results. For more information, please visit: www.bhengagement.com.